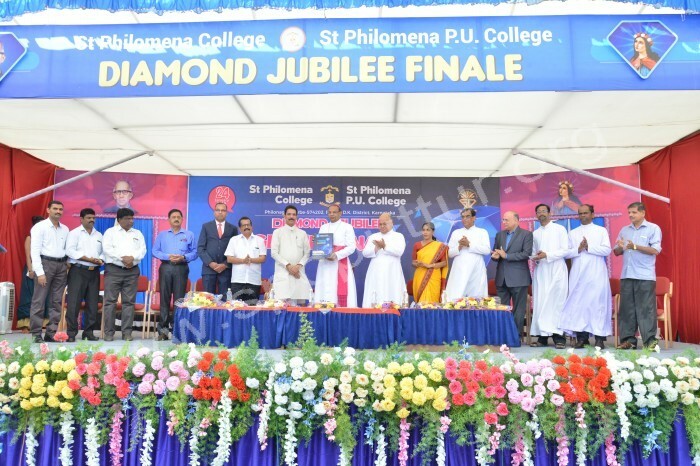 The Grand Finale of Diamond Jubilee Celebrations of St Philomena College Puttur was held on January 24, 2019 in College Quadrangle. The Secretary of Catholic Board of Education Very Rev. Fr Antony Shera participated as the guest of honour and expressed the compliments. The Bishop of Mangaluru Diocese Most Rev. Dr Peter Paul Saldanha delivered presidential address. The DDPU of Mangaluru Mrs Elveera Philomena, Entrepreneur Mr M. B. Sadashiva and Industrialist Mr. Michael D’Souza participated as the guests of honour. As the Bishop of Mangaluru Diocese Most Rev. Dr Peter Paul Saldanha visited the College for the first time, special honour was offered to him. The Campus Director Rev. Dr Antony Prakash Monteiro was honored for receiving VGST award in the area of research publications. The Principal Prof. Leo Noronha was felicitated for having nominated to the Syndicate of Mangalore University. The Assistant Professor of Chemistry Dr Malini K and Assistant Professor of Physics Dr K Chandrshekar were honoured for awarding Doctorate degree. The President of Alumni Association Mr Jairaj Bhandary, President of PTA Mr Antony Olivera and President of PU College PTA Mr Durgaprasad Rai graced the occasion. The members of Performing Arts Association presented the prayer song. The Correspondent Very Rev. Fr Alfred J Pinto welcomed the gathering. The Principal Prof. Leo Noronha presented the report of the College. The principal of PU College Rev. Fr Vijay Lobo proposed the vote of thanks. The HoD of English Mrs. Bharathi S Rai compered the programme. In the afternoon session, cultural bonanza was presented by the students in a colourful manner.